Requirement: Apple Intel Mac, OS X 10.6.3* or later. Compatible with macOS 10.14 Mojave. 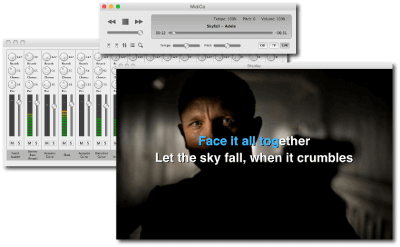 MidiCo professional karaoke software for Apple macOS allows you to host and manage a professional karaoke show. It supports all standard karaoke file types as well as HD video formats. 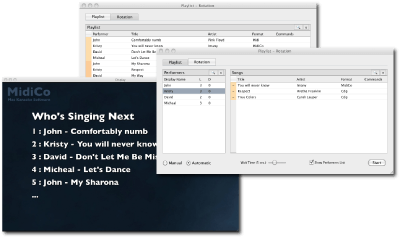 You can also create your own karaoke files in standard midi, mp3 or mdc. You can rip or create CD+G and you can export videos starting from any karaoke file format. Simple, powerfull and intuitive user interface for immediate use. Organize and play the most popular karaoke file formats including: MDC (MidiCo File Format), MID, KAR, MP3 (SYLT-LYR), CDG, CDG Zipped and Karaoke Movie. Midi and Kar files with superior sound quality. With the DLS and SoundFont tecnology you can hear your music exactly the way you intended. Easy controls for Tempo, Pitch and Volume. Quick buttons to show the karaoke display, console display, midi controller, playlist manager and song search. MidiCo is designed to be as easy-to-use as possible. You can synchronize, re-synchronize or modify karaoke files in few minutes. Advanced options allow you to insert credits screen, change font, display images, and more. 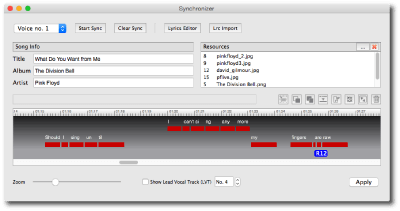 You can also synchronize your midi using the Lead Vocals Track. Playlist Manager with automatic performers rotation keeps singers queue in order in your live show. Complete database management for songs, performers, fovourite performer's songs with advanced search functions. No more "Who's next?" or "When will I sing?". The answer, if you want, will be on display at the end of each song.